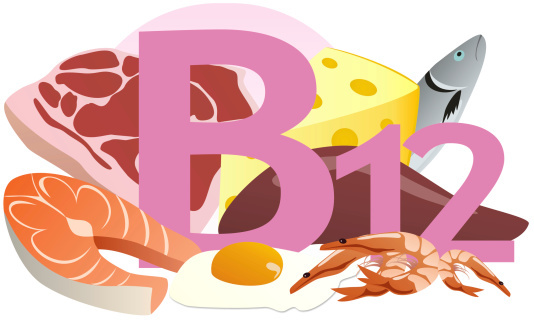 Vitamin B12 is a remarkably useful little nutrient that serves many important functions in the body. It helps red blood cells form and mature, it is used to make DNA, and helps keep nerves functioning as intended. 1. Your body does not produce vitamin B12; it has to come from a diet. 2. B12 is not retained by the body, since it is water-soluble and not fat-soluble. Any B12 not used is lost through urination. These two factors combine to create a situation where it is relatively easy to experience a vitamin B12 deficiency. Your body does not need much vitamin B12 to function and only requires about 25-100 micrograms (1 milligram = 1000 micrograms) per day. However, there are numerous ways you can end up being denied these amounts and develop a deficiency. Being vegetarian or vegan: Vitamin B12 only comes from animal-based foods. If you don’t eat meat or any animal products at all, you have no natural means of replenishing your B12 levels. Pernicious anemia: This is a form of anemia where your body loses the cells that it uses to absorb vitamin B12. Gastritis or acid reflux: Atrophic gastritis will thin the lining of your stomach and medication for acid reflux will dilute the potency of your stomach acid. Both of these have the same end result: your stomach is not able to break down animal protein and get at the vitamin B12 as easily. Intestinal disease: Similarly, conditions like Crohn’s disease, intestinal parasites, or Celiac can affect your ability to absorb nutrients. The same applies to certain autoimmune diseases. Surgery: There are numerous reasons why part of your stomach or small intestine may need to be removed. If this happens, you will have trouble breaking down animal protein and absorbing vitamin B12. If treated quickly enough, the symptoms of vitamin B12 deficiency can often be resolved. However, if left unaddressed for six months or more, there is a higher likelihood that the nerve damage will become permanent. If pernicious anemia is the cause of the deficiency, then leaving it untreated can become fatal. This is an inherited condition that affects the optic nerves. Cyanocobalamin, one of the forms of B12, is known to aggravate the disease and advance the nerve damage. This interaction can potentially lead to blindness. If you must take B12 supplements, try to take them in the form of methylcobalamin, which is a type of B12 that does not have the known interaction. B12 supplements are sometimes administered by intravenous delivery. When this happens, a short term rise in blood pressure is not unheard of, mainly due to the increase in blood volume. The blood pressure spike will return to normal, but people with hypertension may want to opt for a different means of getting the supplement. A stent is a mesh frame that is inserted into an artery to help provide support and keep it open. They are commonly used to treat narrowed or blocked arteries or blood vessels. Due to the way B12 interacts with the vascular system, blood vessels can sometimes narrow temporarily after a supplement is taken. This can disrupt a stent’s placement, so caution is encouraged. Megaloblastic anemia is a possible consequence of a B12 deficiency. It’s characterized by an overabundance of immature or incomplete red blood cells that can’t function properly and crowd out healthy cells. B12 supplements are a typical treatment, but caution should be used if you have low potassium levels. Due to the complications of the anemia, the B12 supplements could drop your already low potassium even further and create a potentially life-threatening condition called hypokalemia. Allergies to vitamins are exceedingly rare, but they do happen. Another possibility is being allergic to cobalt, one of vitamin B12’s building blocks. Numbness, skin disorders, nausea, diarrhea, and difficulty swallowing are potential consequences of the reaction. If you experience any of these following after using a supplement, consult your doctor immediately so they can find out if the reaction is from vitamin B12 itself or another ingredient in the supplement. Gout is a recurrent form of arthritis caused by uric acid buildup. If you have a history of gout or high uric acid levels in general, B12 has been known to trigger a flare-up. Some medications can cause absorption or serum level difficulties that can make it harder to absorb the vitamin B12 from your supplements. These include ACE inhibitors, aspirin, oral contraceptives, vitamin C supplements, and certain anti-seizure treatments to name a few. Always talk to your doctor about possible interactions when beginning a new medication or supplement. If you fall into one of the above categories, you should consult with your doctor about possible side effects from a B12 supplement. In most cases, however, you should be able to take them safely, as long as you stick to the recommended dosages. Herndon, J., “Megaloblastic Anemia.” Healthline web site, July 23, 2012; http://www.healthline.com/health/megaloblastic-anemia#Overview1. Smith, M., “The Side Effects of Too Much Vitamin B12,” Livestrong,com, last updated April 16, 2015; http://www.livestrong.com/article/26012-side-effects-much-b12/, last accessed October 14, 2015. “Vitamin B12,” Mayo Clinic web site, last updated November 1, 2013; http://www.mayoclinic.org/drugs-supplements/vitamin-b12/safety/hrb-20060243, last accessed October 14, 2015. “Vitamin B12 Deficiency,” Methylcobalamin Info web site, http://www.methylcobalamininfo.com/vitamin-b12-deficiency/, last accessed October 14, 2015. “Vitamin B12 Overdose And Side Effects,” Methylcobalamin Info web site, http://www.methylcobalamininfo.com/b12-side-effects-overdose/, last accessed October 14, 2015.